Beanies and mittens have their time, but Spring is more about toys and fun little accessories that you won’t overheat in. 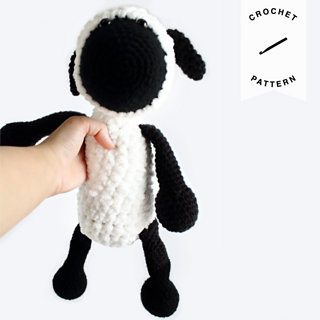 This is an amigurumi pattern for Sammy the Sheep, and he is so easy to work up! Most amigurumi patterns use small stitches and yarn, but Sammy is made of super soft and fluffy blanket yarn, a larger hook, and he’s perfect for cuddling! I used a blanket yarn for the texture which meant I also used a bigger hook. If you have a hard time with tiny hooks and stitches for amigurumi, this is going to be so much easier on your hands and it works up faster. I used worsted weight black yarn to make the face, limbs, and ears for Sammy. I also used a slightly bigger hook than I normally would for those so the fabric is looser and the legs wobble around when you move him. There’s no stuffing in the legs and arms (just the ends of the feet and hands) so you won’t need to worry about it showing through either! SIZING: One size; this sheep is 17 inches from head to toe, and 11 inches sitting. SKILLS USED: a short list of the techniques that go into this pattern. MATERIALS: what I used and recommend. STEP-BY-STEP PICTURES: I took pictures of each step to guide you through the pattern.